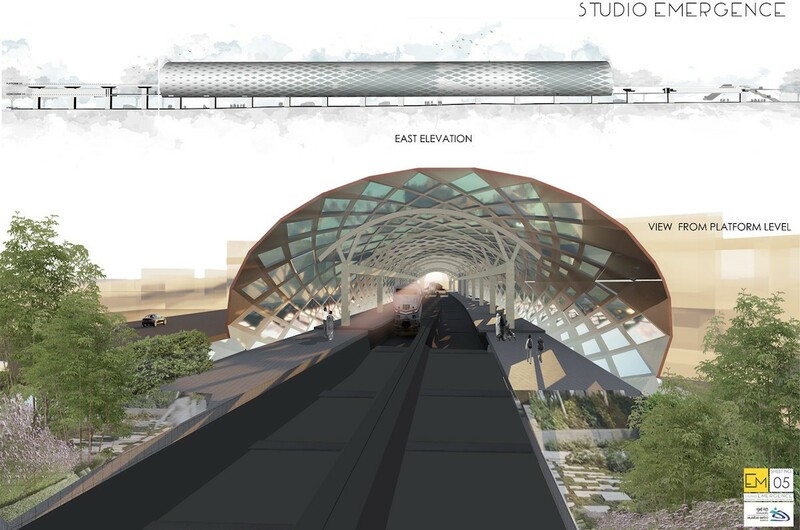 Studio EMERGENCE wins an award for Andheri Metro Station Design Line 7. Conducted by MMRDA extending opportunity to young architecture firms across India. 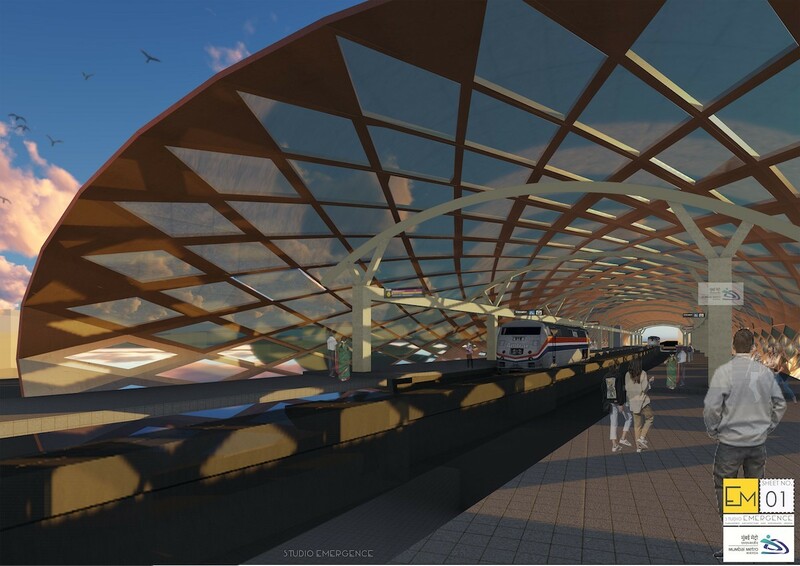 Studio EMERGENCE is celebrating its win recognized by MMRDA both at a national and regional level for its infrastructural project of designing Andheri Metro Station Line 7. Studio EMERGENCE is quickly becoming a key player in the design of the urban structure and mixed-use projects, by making use of parametric architecture and integrated designs derived from inspirations of nature and bio-mimicry of strong geometric forms. Project Description: Andheri Station is already considered as the HUB for transportation due to the several linkages it provides and its strategic position. Adding this metro station will only add to the amount of footfall. Since the metro is an elevated system it is imperative to have designs that merge into the city’s fabric. These massive structures need to be treated as positive interventions. The structure is a rational response to a series of programmatic requirements and constraints. The result is a steel-and-glass canopy that rises. The stunning oculus form creates a new structure that is functional, contemporary, and contextual; a new grand civic space for the city of Mumbai. Since structural steel is not only super-strong and durable but can be used in innovative ways, turning the regular into something quite transforming, the main structural system is mainly of steel. The station façade is a parametrically designed ‘Jali’ with aperture sizes increasing in size proportional to the distance from a high rise next to it, giving privacy to the residents surrounding the structure. It also provides light and ventilation and also adds to the artistic element of the overpowering structure. The result is a rhythmic pattern on the façade creating dramatic shadows on the platform and concourse level. Wayfinding was integral to the design with unobstructed views across the public spaces, a visual connection to the central circulation spine, and ample outdoor views. The use of architecturally exposed structural steel enhances the unique architectural expression and its use, prominent throughout the public areas, and achieved the desired visual quality and texture. Achieving a roof structure reminiscent of a ‘Jali’ involved the use of curved tapered steel plate girders which dynamically intersect in the middle of the structure. The flooring pattern also resonates with the ‘Jali‘ pattern to allow synergy and continuity in the design. The primary structural system consists of (16) steel arch trusses spanning nearly 17m. Though the overall geometry of the metro station is a complex, seemingly free-form series of curves, the realization of this geometry was achieved by using only members curved to one circular radius. The rationalized geometry approach allowed the geometry to be conveyed in simple two-dimensional plans and elevations, without the need for either three-dimensional work point schedules. For the terminal’s central spine, field erection was sequenced to utilize the rigidity of the X-girders to minimize movements and the need for extensive temporary bracing. Additionally, the joints provided improved thermal expansion characteristics for the concourse which is nearly one-quarter of a mile long. Because much of the steel framing was exposed, the design team worked closely to develop details that achieved the architectural vision and were also efficient to fabricate. The fabricators can make extensive use of custom jigs and fixtures to position the members in the shop to minimize welding distortion in cruciform columns and architecturally exposed structural steel curved roof girders. The apertures which create the pattern are a series of open, opaque and transparent panels to enable the station to be well lit and ventilated. The roof panels have been given openings polycarbonate sheet so as to ensure the station is naturally lit. The platform level has ample openings to help ventilate the non-air-conditioned space whereas the roof will have lesser openings which will enable light but also prohibit excess heat in the Mumbai weather. To keep the design within budget, the exposed connections were engineered to use only conventional structural steel fabrication techniques and materials but took great care to shape the connections to be aesthetically minimal and consistent. All exposed structural steel is painted white/grey with a high-performance coating system consisting of a shop-applied zinc-rich primer and a finish coat. All steelwork was blast cleaned to ensure the longevity of the coating system. The resulting design conveys a clean, modern machine-like aesthetic, without the use of expensive custom castings. To satisfy green credentials, structural steel can be sourced from local mills and produced from more than 90% recycled content. About the competition: MMRDA had conducted a competition to invite architects from all over India to design the new Metro stations coming up in Line 7 in the Western Suburbs. This is an initiative taken for the first time by the MMRDA to invite architects outside of their office to design such an important landmark in the city. After the initial site visits, all the bidders were given a brief for the stations and the scope of work. We were shortlisted in the top 10 architects who were then called to the MMRDA office for a presentation. The final results were announced later where Studio EMERGENCE bagged the Andheri Metro station along with another firm. We are quite glad to receive this opportunity and contribute to the infrastructure design in the city. This project will be executed by MMRDA in 2019.